Members of the Lords have recently insisted they had a right to fight a clean-break Brexit and even to try to keep Britain in the European Union. Just this week they have voted against leaving the EU Customs Union and have thrown the Government into turmoil. They have also been heard to be grumbling and complaining about the increasing workload due to Brexit so much so that they have managed to win themselves a pay rise on top of their lavished subsidised catering. 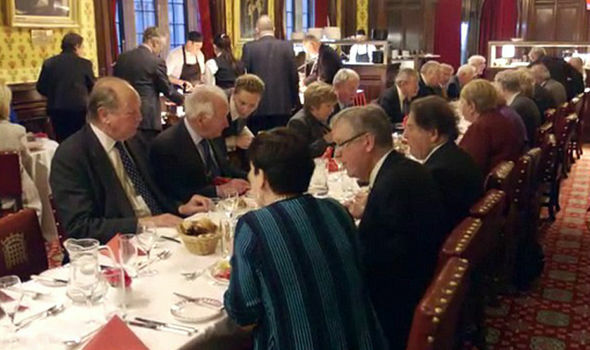 In the lavish dining rooms of the House, Lords and Ladies can tuck into chargrilled poussin, or Brixham Dover sole. And when the unelected lawmakers are thirsty from all the debating they can have an ice cold pint of Carlsberg at £2.90 massively lower than prices elsewhere in central London. On Brexit the comments of these unelected and unaccountable Lords has left many people demanding it be abolished immediately. Labour peer Lord Mckenzie said: "We should push our authority to the limit in challenging the Government on their proposed deal." Conservative Baroness Altmann said that Lords had a duty, despite the apparent personal attacks they face, to speak out about the risks to working class people of a Brexit which put "politics above economics”. Other examples of the insanity within the House of Lords is Baroness Smith of Gilmorehill, who has claimed £220,000 of expenses over her 27 year career on the red benches and has never spoken once in a debate. Baroness Falkender, a former private secretary to Prime Minister Harold Wilson, has not made a maiden speech in her 42 years since acquiring the title! Daily expenses allowance now stands at up to £305 which is up by £5 and is more than most have received in a pay rise. The £305 daily rate does not account for the benefits gained from subsidised restaurants. It also does not include travel expenses which can be claimed separately and can run into tens of thousands a year. UK Unity says scrap the unelected House of Lords now! Read: "INCREDIBLE leaked letter could DESTROY Diane Abbott! " Read: "Manchester bomber's Cousin in SICKENING assault on pregnant woman"